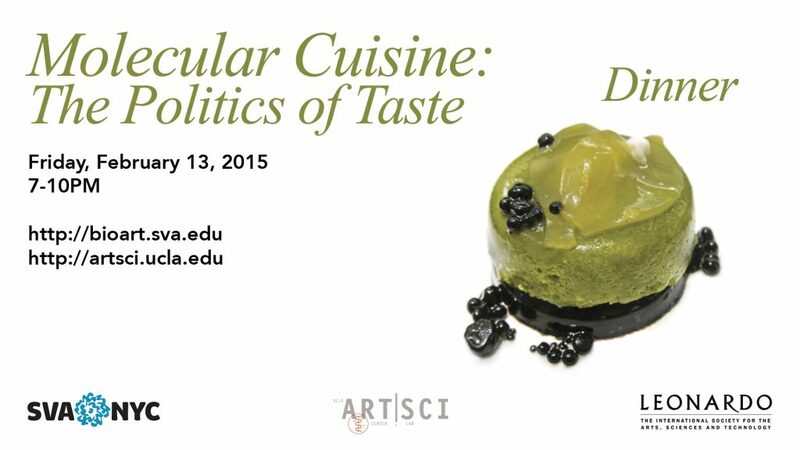 On Friday February 13th, 2015, together with Suzanne Anker, I hosted “Molecular Cuisine: The Politics of Taste”at the School of Visual Arts in NYC in conjunction with Leonardo’s Education and Arts Forum (LEAF) for the College Art Association, CAA. This event was a sit down dinner investigating the various ways cultures approach the concept of food. From molecular cuisine to sushi to miracle berries, we explored the intricacies between taste and value, employing food as a filter and as an art material. More info linked to poster below. This entry was posted in Uncategorized by VV. Bookmark the permalink.